Thank you for visiting and shopping at Gardenstone Inc. Following are the terms and conditions that constitute our Shipping Policy. Most of the large orders are made-to-order and require additional 5-9 days before shipping occurs. If we are experiencing a high volume of orders, shipments may be delayed. Please allow additional days in transit for delivery. All of the products offered by Gardentone Inc. are being shipped for FREE across Canada and the continental US. Gardenstone Inc. reserves the right to refuse free shipping for any irregular, rural, or non-service areas in our sole discretion. Most of the regular courier deliveries (via UPS, FedEx, Canpar, Purolator, Dicom, etc.) take between 2-7 business days. Expedited and overnight delivery options are available for an extra cost. 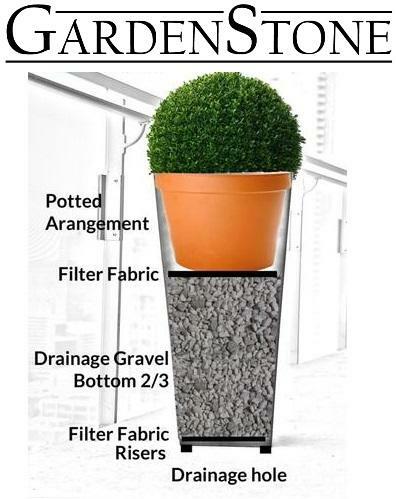 Please contact us at sales@gardenstonemfg.com for more details. Freight deliveries might take between 2 and 11 business days, depending on location and its LTL Freight availability. Delivery delays can occasionally occur to no fault of Gardenstone Inc.
Gardenstone Inc. does NOT ship to P.O. boxes or APO/FPO addresses. 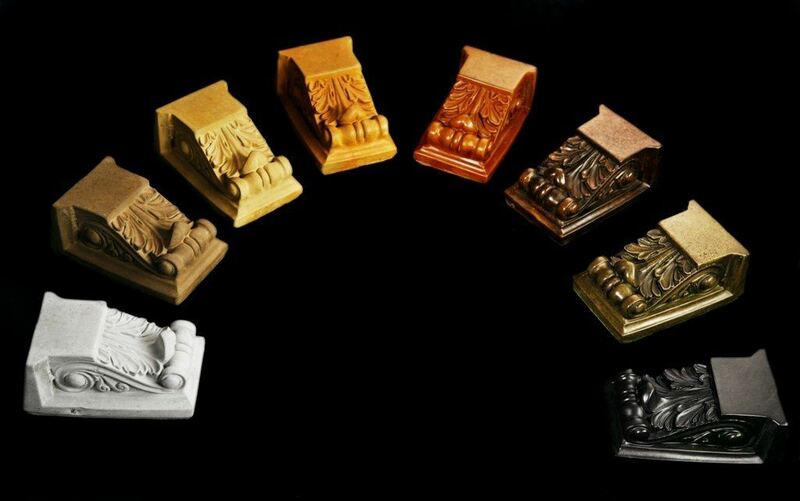 Gardenstone Inc. is not responsible for any customs and taxes applied to your order. All fees imposed during or after shipping are the responsibility of the customer (tariffs, taxes, etc.). If any of the products in your order has been damaged or lost during shipping, please contact sales@gardenstonemfg.com as soon as possible. Please include a detailed description of the damages or loss with high-quality detailed photos of both damaged products and packaging it arrived in. We will submit a claim with the carrier and advise on the further actions. You might need to keep the original packaging and damaged products in case carrier request an inspection. Failure to follow described above procedures might result in an inability to process refund or replacement. Our timeless designs and hand crafted finishes will bring joy and pleasure to you now and well into the future. Below are instructions to help protect your GardenStone Planters, Benches, Birdbaths and Fountains. These pieces will remain beautiful for years to come if the following guidelines are utilized. Place planters on small risers or decorative risers to allow for proper drainage. Water must be able to escape the planter. 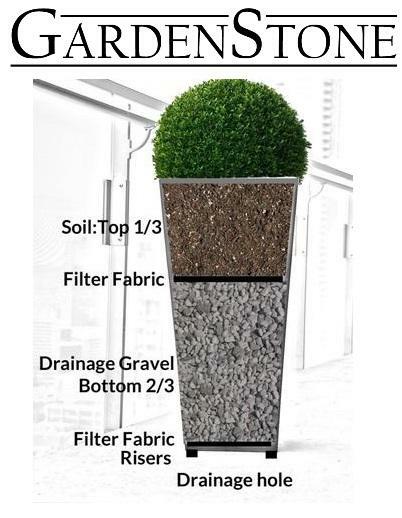 Fill planters a minimum of 2/3 full, with a clear gravel or aggregate ¾" or larger. This will weight the bottom of the planter to prevent tipping and provide adequate drainage. Filter cloth can be placed on top of the gravel to prevent soil from draining through the bottom drainage hole and /or clogging the aggregate. Soil can then be put on top of the filter cloth and gravel, or for better results, have arrangement planted separately in a plastic container and place on top of filter cloth and gravel. Your planter should have risers beneath them to ensure drainage hole does not freeze against the ground surface, as well as to remain above the frost line to prevent damage to the bottom of the planter. Planters should also be 2/3 full of ¾ or larger stone (used for drainage) to avoid a large amount of moist soil from freezing and expanding. Ensure planters are kept clear from harsh salts and chemicals, as these may damage the stains and/or concrete. Fountains and Birdbaths must be fully drained and free of water before freezing weather occurs. It is essential that any pumps be brought in for the winter or completely dried within the fountain. If the pump is going to be left within the fountain, after removing all moisture, a fountain cover must be used. Fountain covers can be used for fountains and birdbaths – these covers are made with a specialty material that is one-way breathable – allows moisture to escape but no moisture to enter the fountain/birdbath. *Fountain Covers available upon request. Benches should have small risers beneath them to ensure the legs remain above the frost line to prevent damage to the bottom of the legs - it is important that bench not be placed directly on soil for this same reason. We recommend that benches be covered for the winter season for the utmost protection. To restore the luster of GardenStone's Bronze and Black Stains – White vinegar can be used to wipe clean Planters, Fountains, Birdbaths and Benches with a soft cloth. Drainage aggregates are included only for local (Greater Toronto Area) orders.